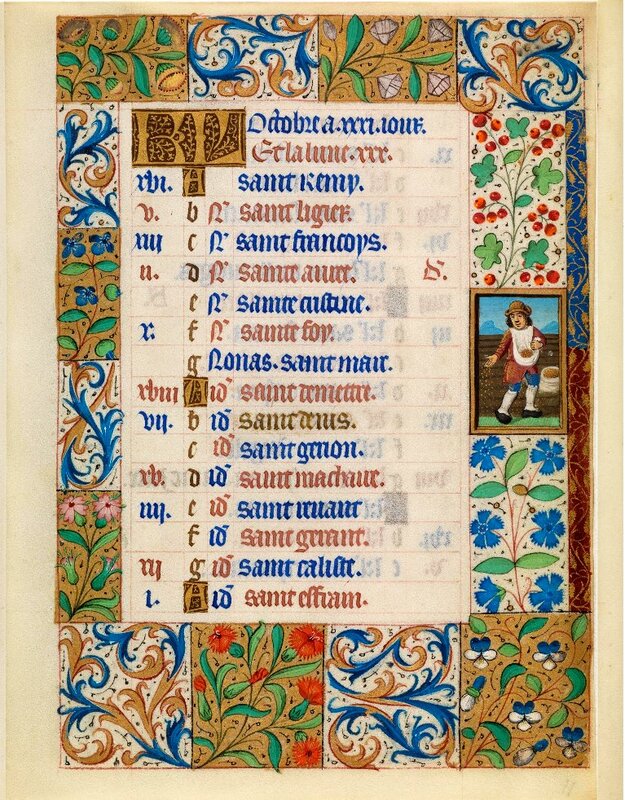 This is a delightful Book of Hours, with a lavishly illustrated calendar, many large miniatures, and delicate floral borders on all the text pages. The artwork is superior, with even the smaller versals beautifully executed. This Book of Hours would suit a late15th to early 16th century persona. E-codices description: Parchment · 210 ff. · 16.9 x 12.8 cm · Paris / Tours · second quarter of the 15th century and around 1490. 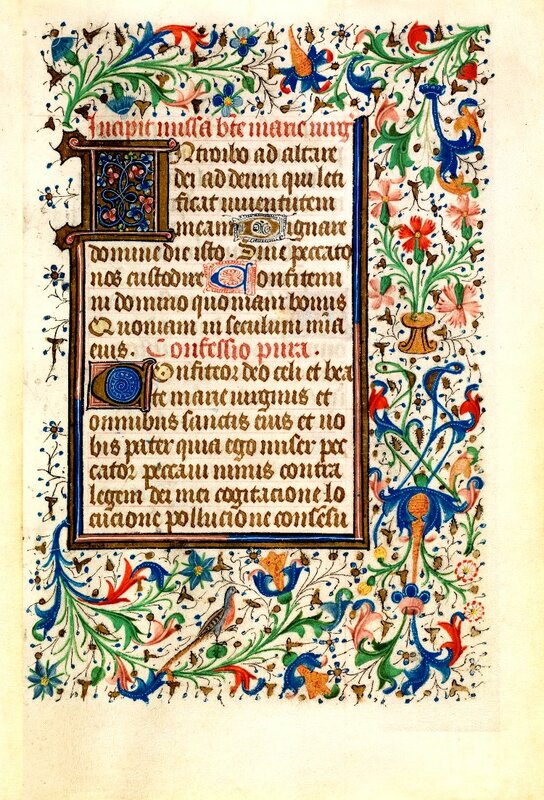 A book of hours in Latin and French, written in the second quarter of the 15th century in Paris, but not illuminated until 1490 in Paris or perhaps in Tours by various artists who shared the work. 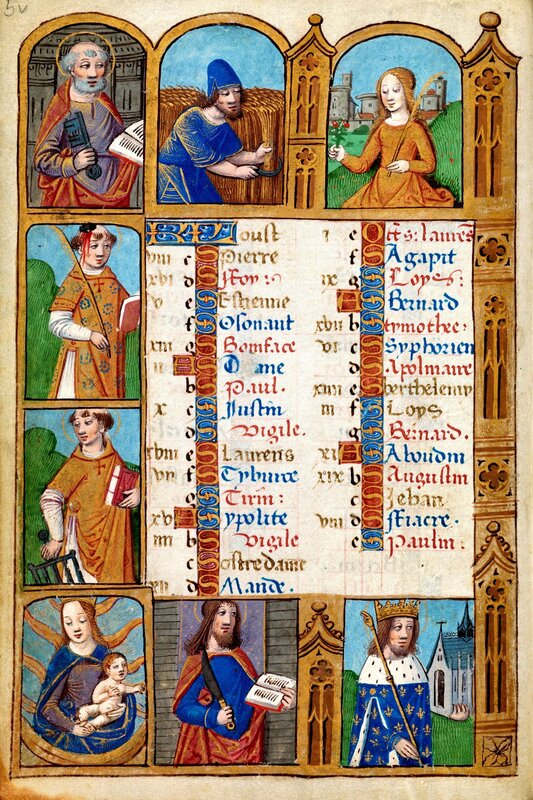 Two miniatures as well as the decoration of the calendar and of the Office of the Dead are the work of an artist from the circle of the Maître François, a close collaborator of the Master of Jacques of Besançon, who honors Notre Dame in a veduta of the city of Paris (f. 93r). The luminous colors and the monumental forms of the other miniatures attest to the influence of Jean Bourdichon of Tours. 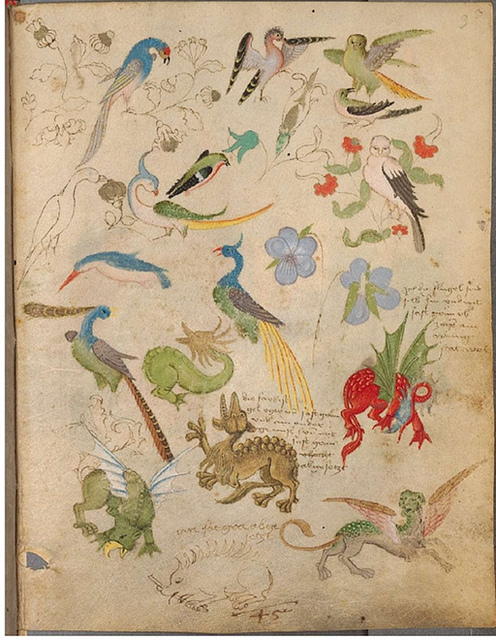 This artist can probably be considered responsible for the Master of the “Chronique Scandaleuse,” who, during the creation of this manuscript, was still working under the guidance of Jean Bourdichon. This manuscript is also available in English. 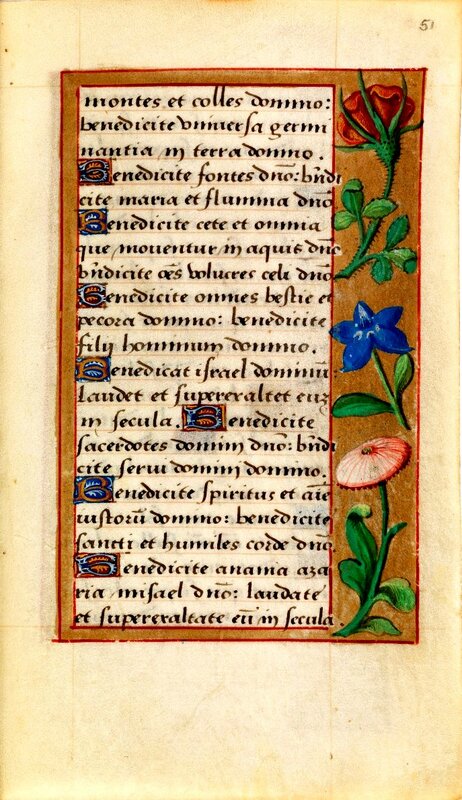 I think this is the single most beautiful and charming little Book of Hours I have ever seen. Every page is a gem, with goldwork and floral or landscape borders. 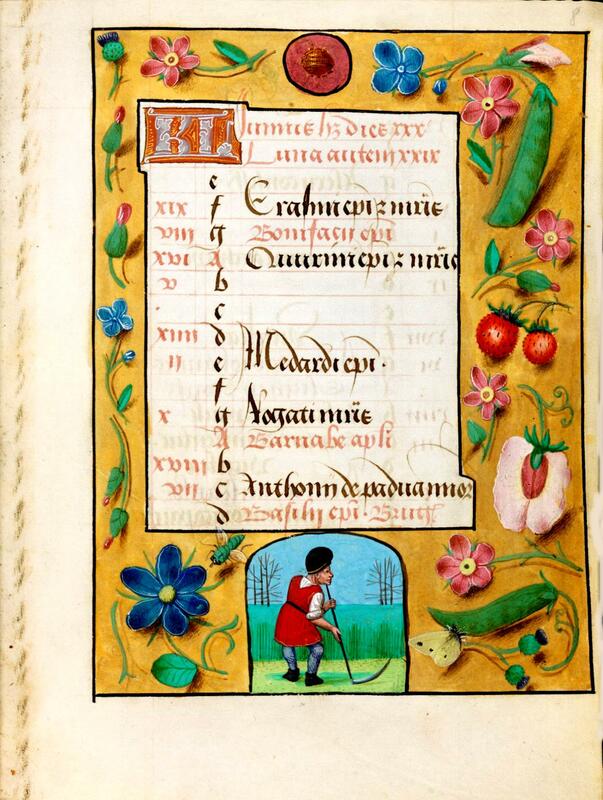 This Book of Hours would suit a 16th century persona. Note: At some point in its life this manuscript was heavily trimmed at its top and outer edges. I have given the reproduction a background parchment image in order to restore it to something closer to what its original proportions must have been. Because of the natural variation in parchment colour, this causes some of the pages appear to have a slightly differently coloured border. E-codices description: Parchment · 179 ff. 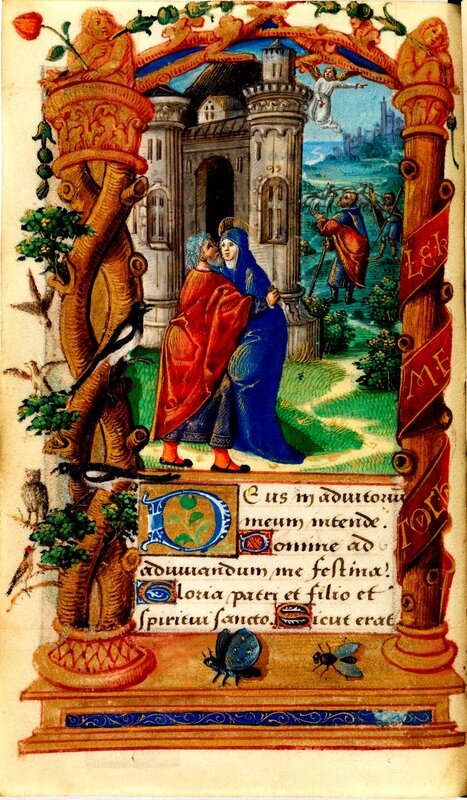 · 14.5 x 8.5 cm · Dijon · 1524. 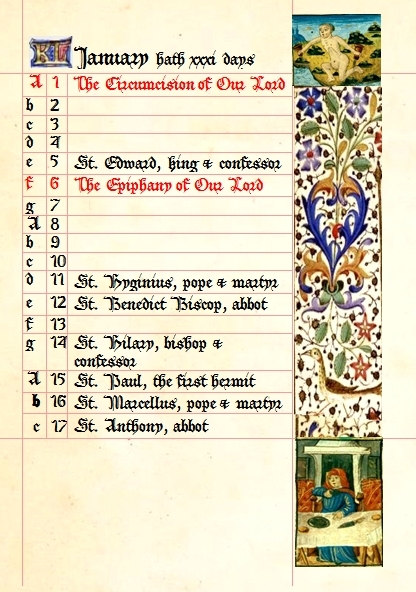 A book of hours following the liturgical custom of Rome, with a calendar containing a selection of saints for Langres. The manuscript was illuminated and dated in 1524 by a Master of Bénigne Serre, who was known by the name of his client, a highly-ranked official of the King of Burgundy. The artist was a hitherto unknown illuminator from the circle of the “1520s The Hours Workshop,” which framed the miniatures with Renaissance architecture or added naturalistic flowers and animals to borders. This manuscript contains a number of unusual images, e.g., for the Lauds of the Office of the Virgin, the meeting of Joachim and Anna at the city gate of Jerusalem replaces the usual image of the Visitation. 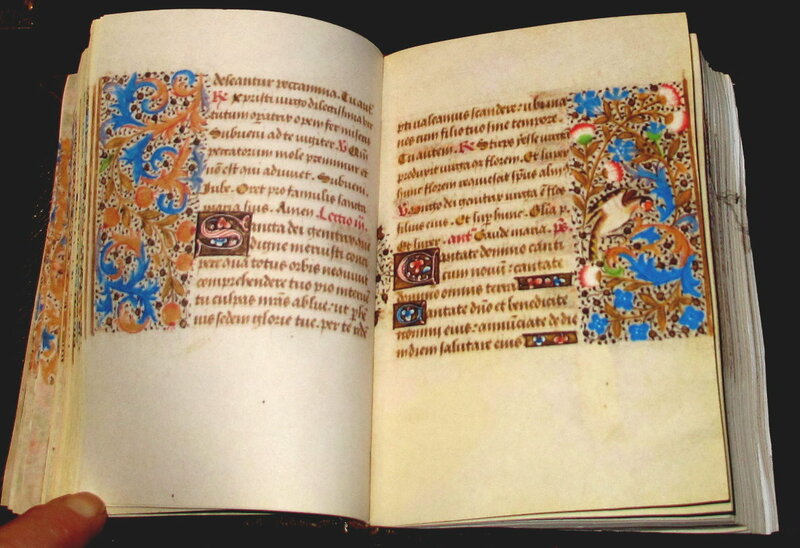 In the 18th century, the manuscript was owned by the family Bretagne of Dijon. Every page in this book is a delight of colour and imagery. There simply are no plain or boring bits. A nice choice for a Tudor or Elizabethan persona. 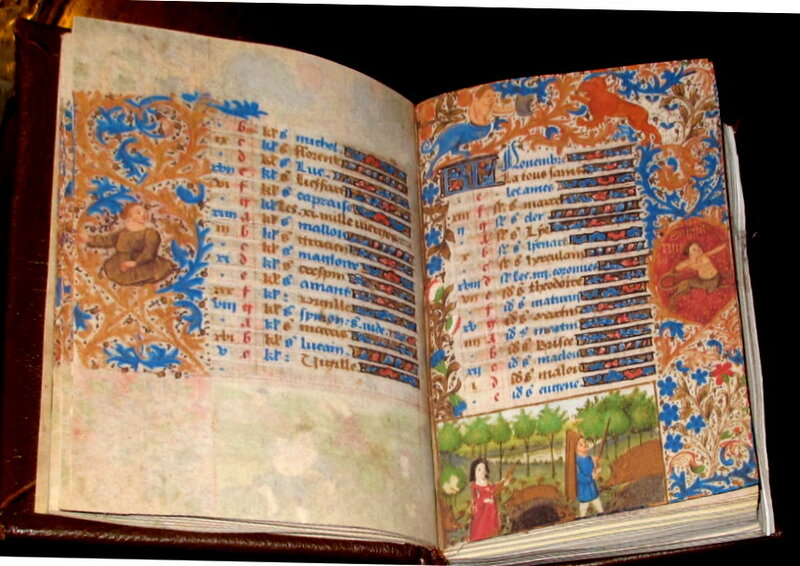 This book of hours was a present from the Parisian publisher Anthoine Vérard to the French King Charles VIII (1470-1498). The monarch was one of the most important figures for the French book trade from 1480 on. His collecting is inextricably linked with the luxurious printed materials of the bookseller and publisher Anthoine Vérard. 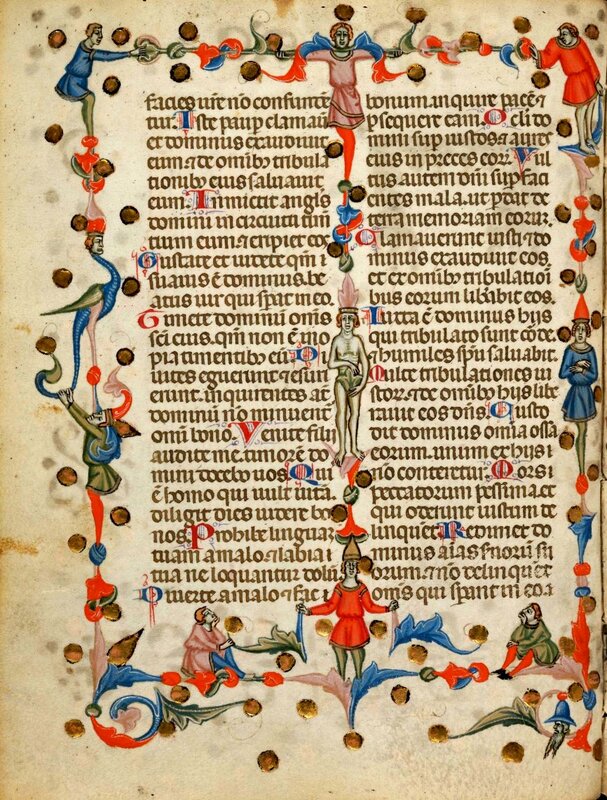 Especially remarkable are the borders: the margins of all pages are decorated with a pictorial narrative of eight consecutive images showing events from the Old and New Testament. 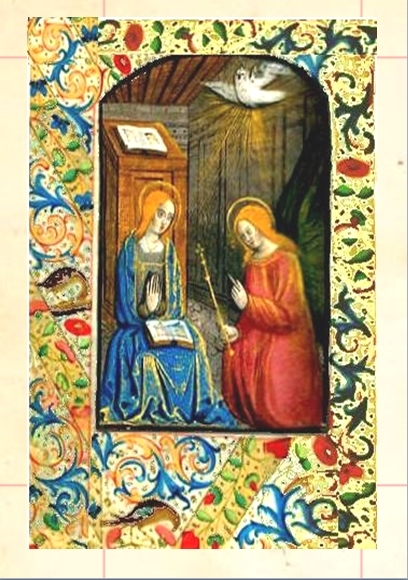 Also noteworthy is the didactic value of this book of hours, since each pair of images has a commentary of several explanatory verses in Middle French. 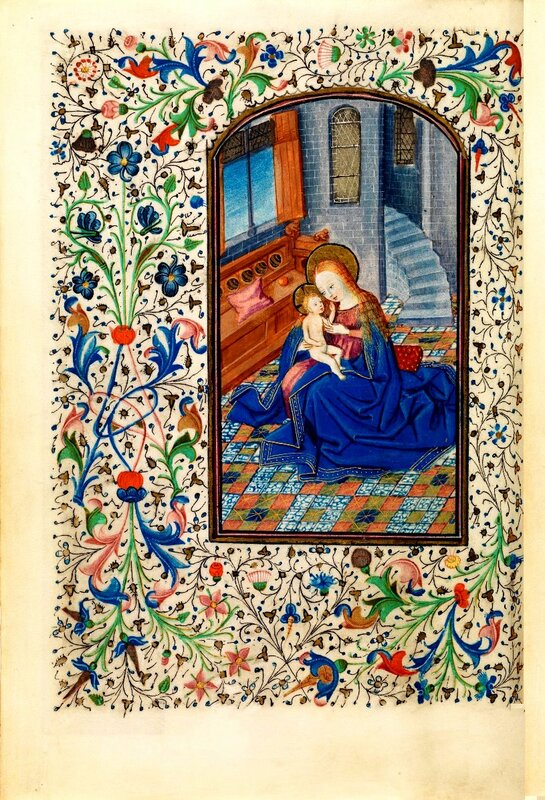 Although this is a relatively plain Book of Hours compared to the previous ones, the full-page miniatures are lovely and each page has delicate ivy or floral scrollwork in the borders. The ivy-filled 2-line versals are also particularly fine. 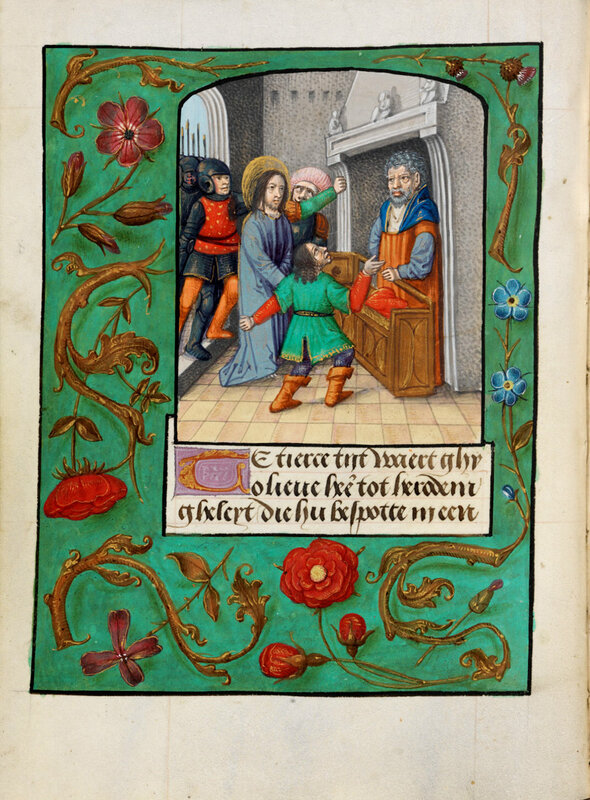 This Book of Hours would suit a 15th century persona. 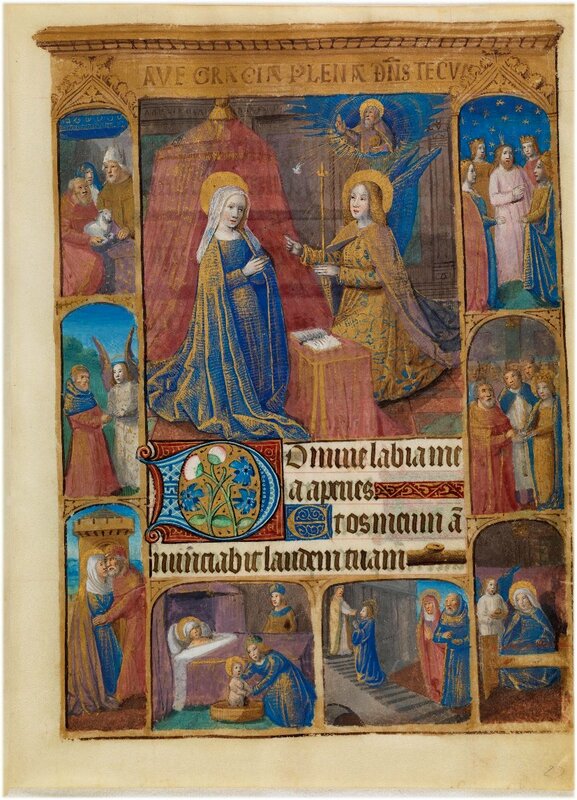 This book of hours, addressed to a woman, contains an entry that can only be read in ultraviolet light (f. 27v) and that mentions a Jaquette de la Barre; she probably was part of the Parisian family of organ builders who, between 1401 and 1404, built the organ of Notre Dame. The miniatures were created around 1410 by a leading Parisian master, who can be identified as the Master of the Mazarin. Subsequently, borders were added to the manuscript, probably by a Provençal hand. 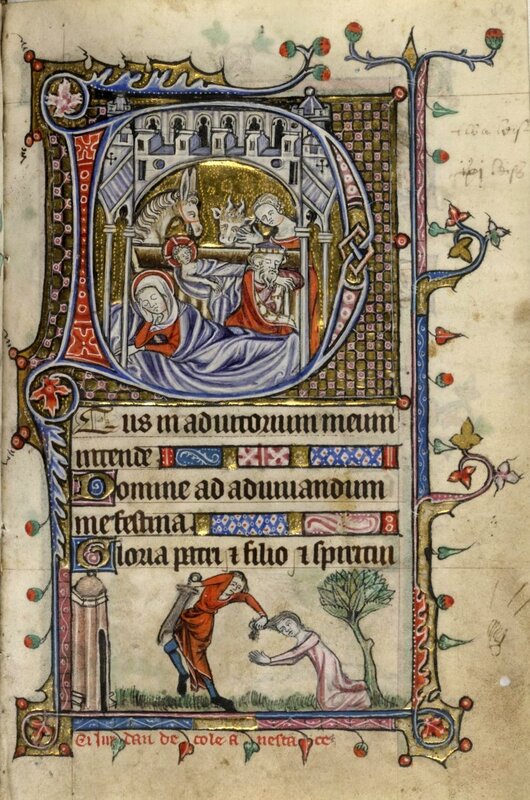 Several scenes stand out from the conventional iconographic program: instead of the penance of David, there is the glory of Christ on Judgment Day (f. 101r); instead of the Mass for the dead, there is the Raising of Lazarus (f. 141r); also unusual is the depiction of the prayer of St. Jerome (f. 139v) in the full vestments of a cardinal. 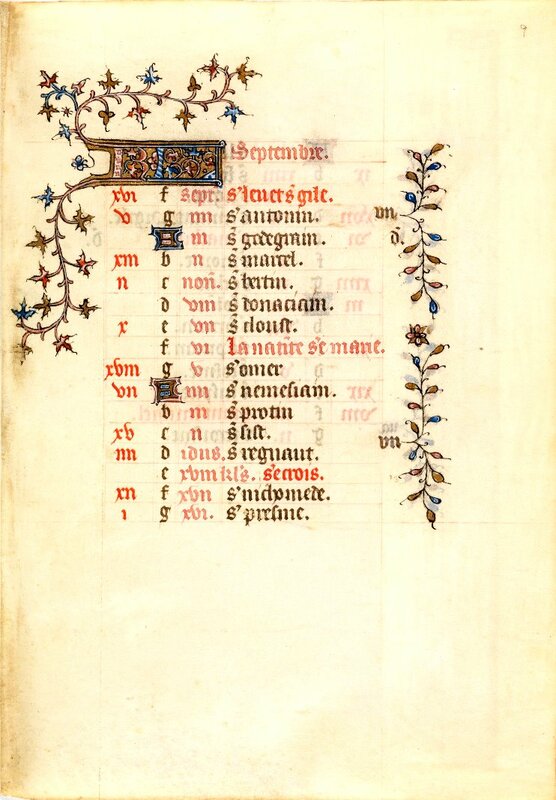 Again, a plain calendar and very plain text pages, but quite a few lovely full-page miniatures with decorated facing pages. 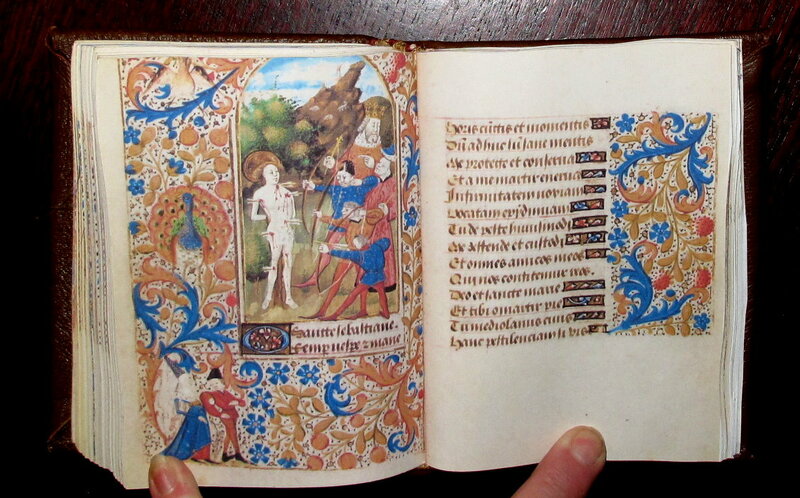 This Book of Hours would suit a mid-15th century or later persona. 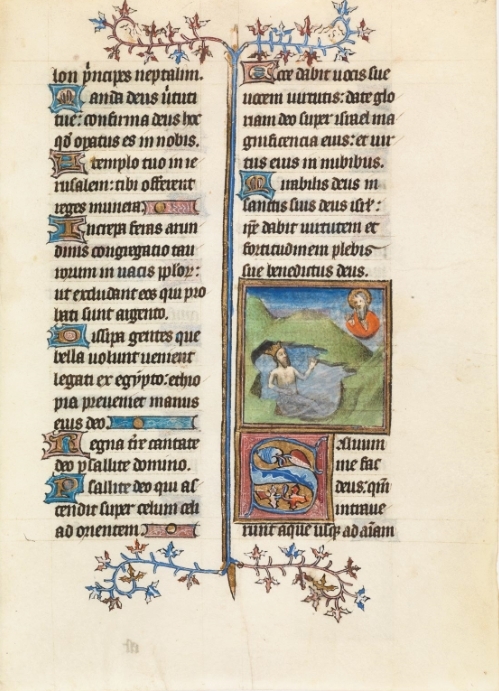 Two artists, active around 1440/50, contributed to the decorations of this book of hours: the older one, who created only the three miniatures on f. 13v, 105v and 140v, is part of the “Goldrankenstil,” while the younger one is characterized by greater physicality and more vibrant coloring because he was influenced by the innovations of the contemporary painting of the van Eyck brothers. This second artist is responsible for the completion of the Turin-Milan Hours in the year 1440 and also contributed to the Llangattock Book of hours. In 1813 the manuscript was given to the prioress of the Cloister of the Bernardine Sisters of Oudenaarde by the Prince of Broglie. Richly-decorated calendar pages and full-page miniatures in the trompe l'oeil style and text pages with many decorated versals. 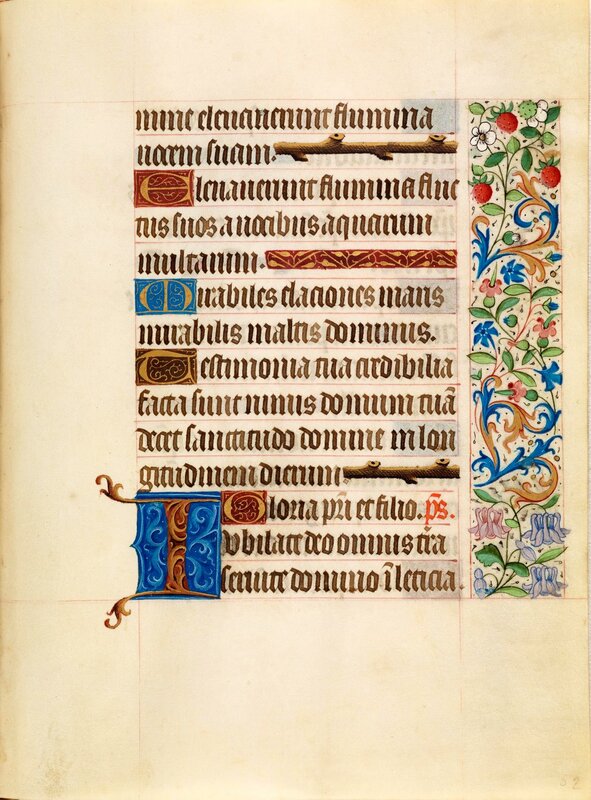 A very beautiful manuscript, this Book of Hours would suit a late-15th century or later persona. 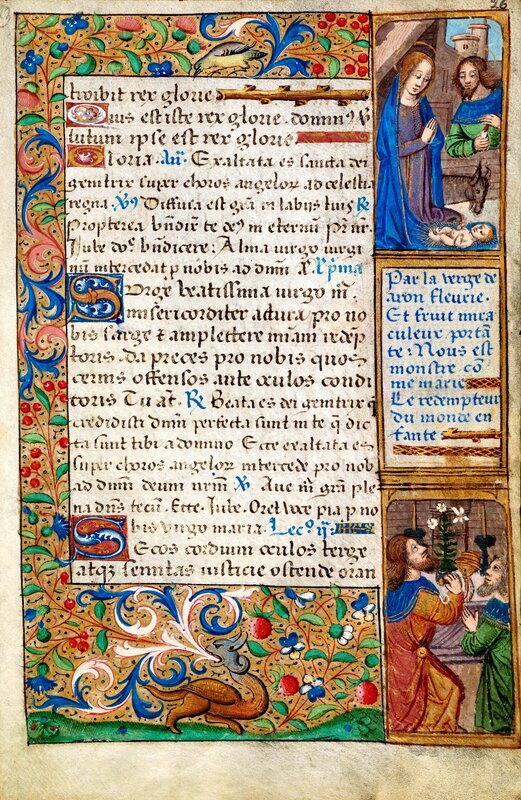 A Book of Hours following the liturgical usage of Rome, richly illustrated with full-page miniatures, borders, and initials, written in cursive script (Bastarda), which can be dated to about 1500, with texts in Latin, French, and Flemish. The style of the miniatures, especially that of the naturalistic borders with flowers and insects, but also with complete scenes, seems typical of the Ghent-Bruges school. This nice little book is obviously from the mid-1400s or slightly later, despite Davidson College's assertion that it was probably in existence 150 years before the printing press and that it dates from 1400. I contacted them about this; it took a while to get an answer and their information has not changed. I saved copies of the book before it was cleaned, and the resolution is only good for A6 or A7 format. 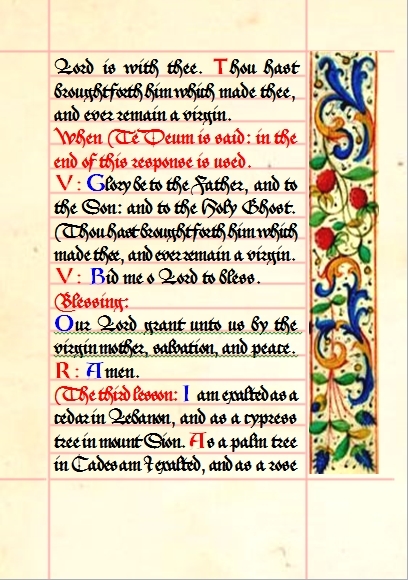 It is only available in English; I have taken the decorative elements from the manuscript, which probably gets around the problem I'd have if I reproduced it as-is. I do hope they'll work out what they actually have at some stage, and include useful information such as its dimensions and where it was probably produced. 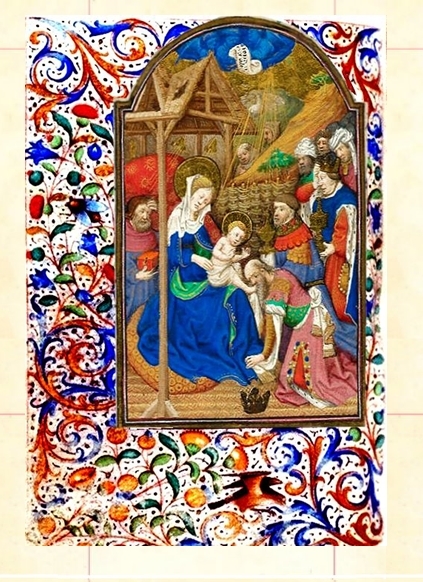 This manuscript is from the British Library's collection and is a richly-decorated earlier-style work with borders and bas-de-page figures and every page. Below is their catalogue description. 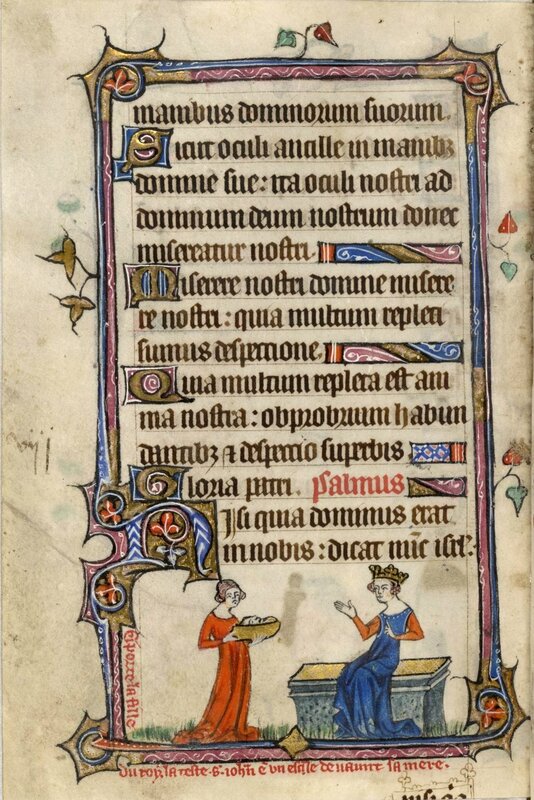 Artists Sandler 1986 identifies the artist as that of Glasgow, University Library MS Hunter 231, made for Roger of Waltham (d. c. 1336), canon of St. Paul's, London. 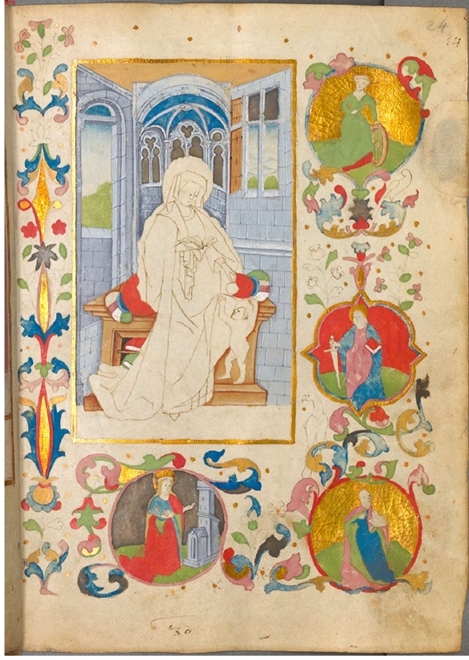 The style and subject, especially the many bas-de-page narratives ranging from romance and fabliau to biblical and hagiographic material, are closely connected to two important manuscripts thought to have been illuminated in London: Egerton 2781 (the 'Neville of Hornby Hours') and Royal 10 E IV (the 'Smithfield Decretals'). 24 calendar roundels, in colours and gold (ff. 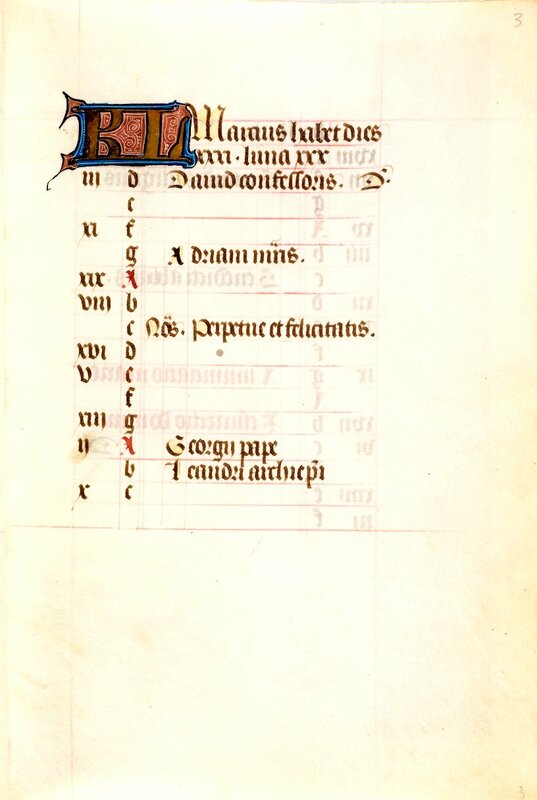 1-6v). 24 large and smaller miniatures, in colours and gold (ff. 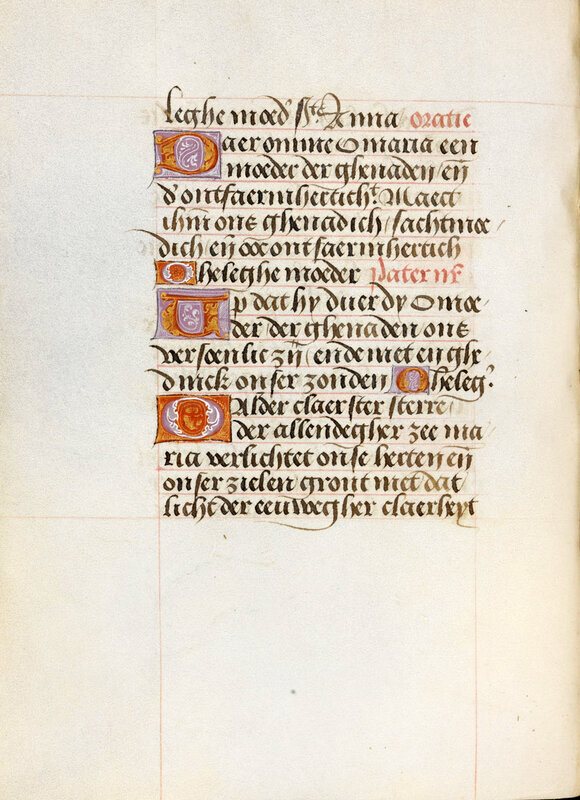 7, 16v, 18, 33, 59v, 60, 71, 89 [historiated initial], 94v, 98v, 112v, 118, 118v, 119, 120v, 121v, 122v, 123v, 124v, 125v, 126, 139, 150v, 151). All pages with full foliate borders and bas-de-page scenes and grotesque decoration, in colours and gold. 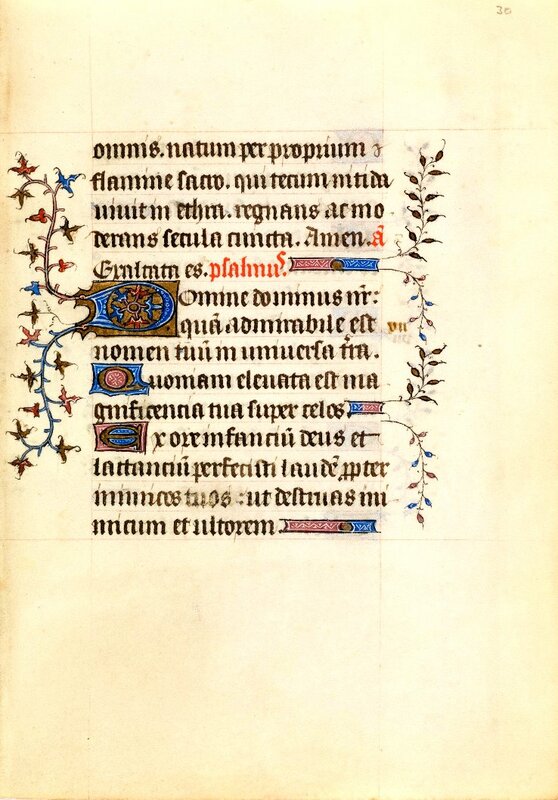 Large and smaller decorated foliate initials, in colours and gold. Small initials and line-fillers in gold on red and blue grounds. This book of hours in the Parisian fashion is richly illuminated and was made for the diocese of Nantes in the third quarter of the 15th century. It was owned by the Petau family during the 17th century. In 1720 it was purchased by Ami Lullin of Geneva and donated to the Bibliothèque de Genève. 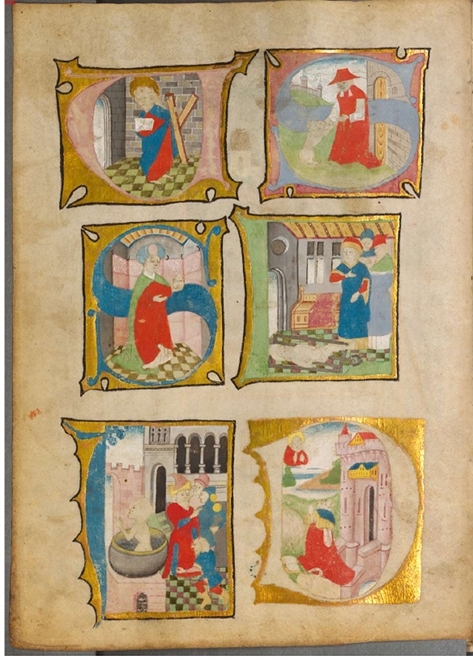 As I started the project of printing Books of Hours I browsed the Internet to see what might be available, and soon realised there were a great many book images from the mid-1400s out there, some in surprisingly high resolution. 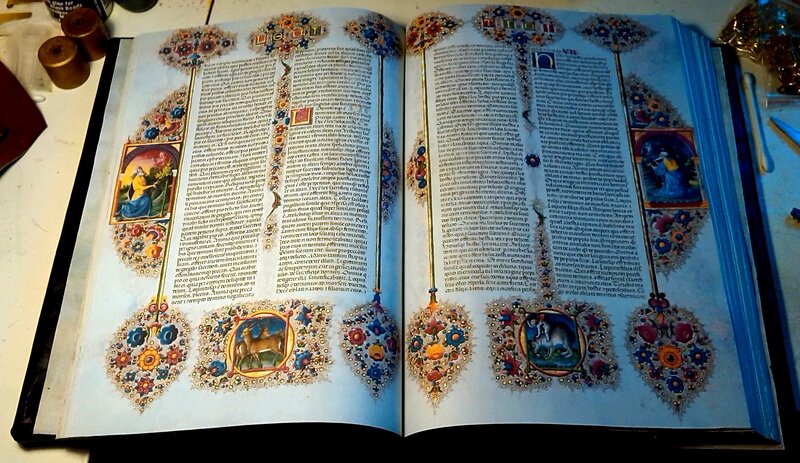 In fact, I thought, there may well be enough for the complete illumination program of a whole Book of Hours. 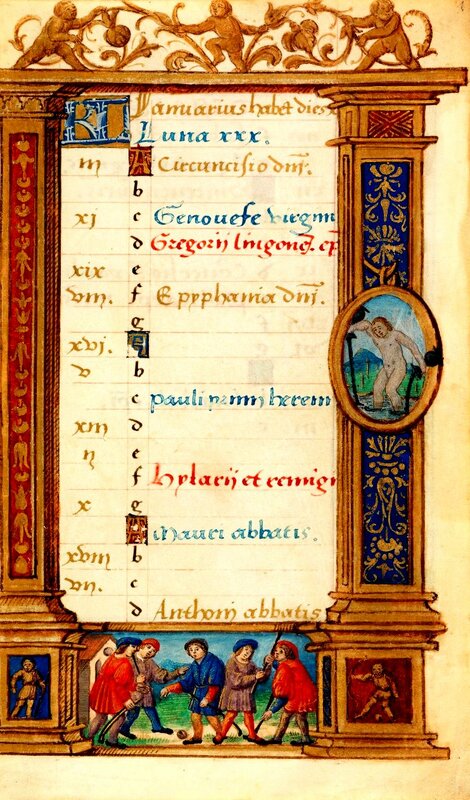 And thus was born a Book of Hours that never actually existed. 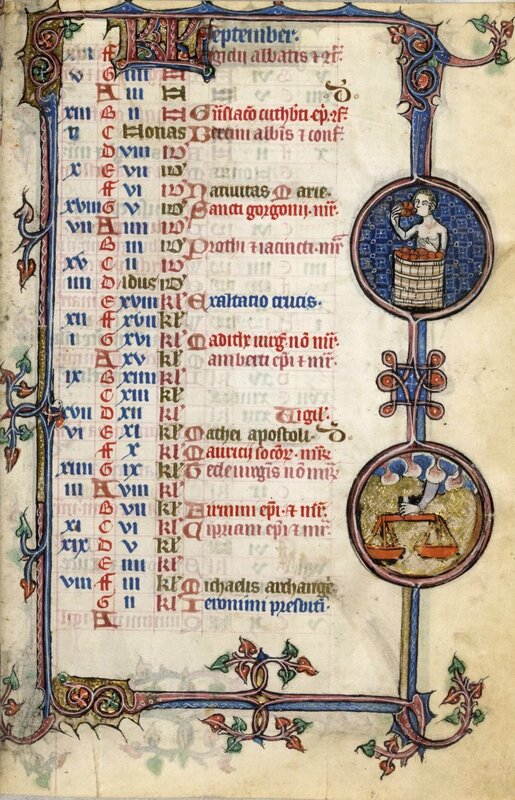 With the calendar from one source and the miniatures and borders from many others, we have a perfectly plausible volume which was obviously worked on by a number of different artists over a period of forty years or so. 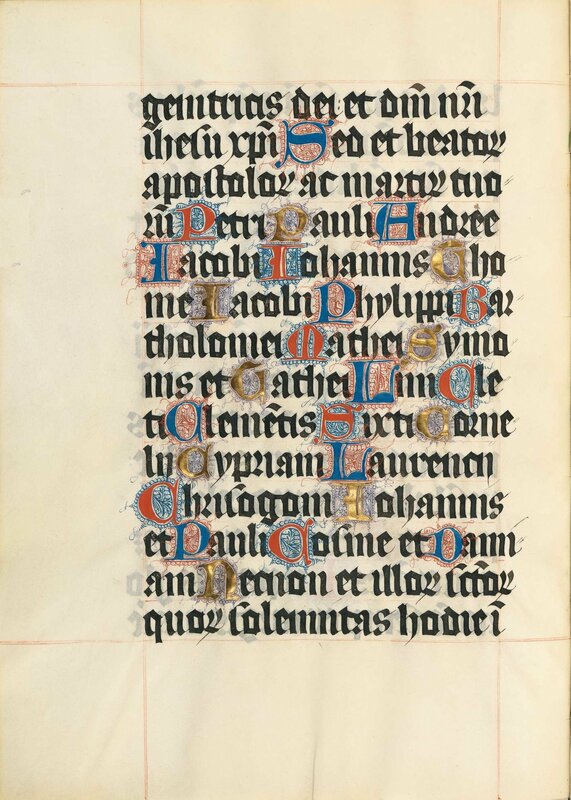 So -- illumination by the Google Master, and English translation (the Hypertext Book of Hours) by the Master of the Run-On Sentence -- some are more than two pages . Creating it was a lot of effort, but also a lot of fun. It's format is A5, a very common size, and it is availble in English only. 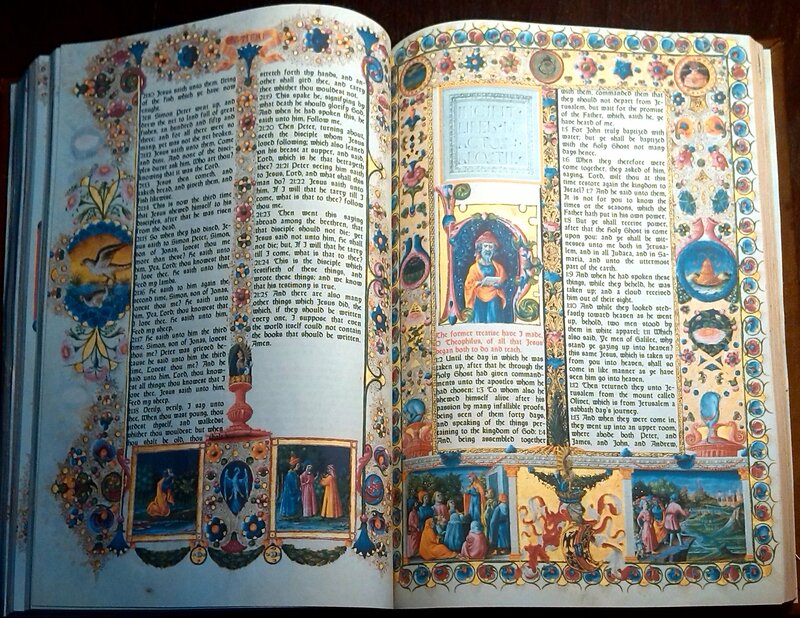 This book has several fine miniatures, historiated initials, and coloured versals. It would suit a persona from the mid 15th century onwards. 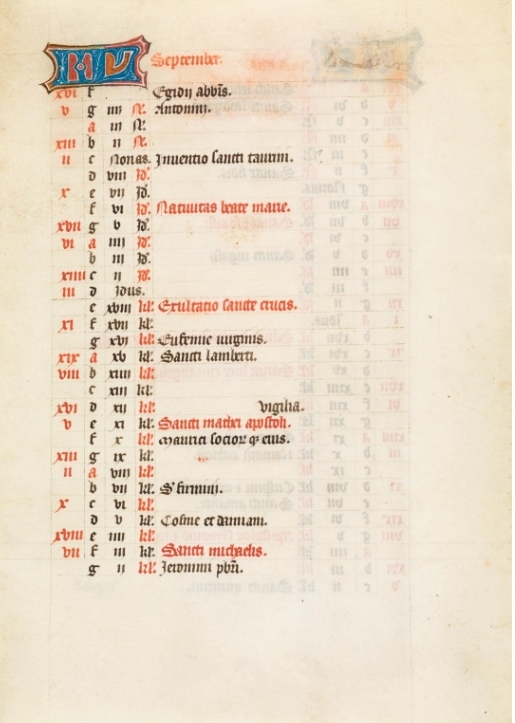 The manuscript contains a psalter for use in Evreux, episcopal city and preferred residence of the kings of Navarre.This is a liturgical book which contains the calendar, the litany and the Office of the Dead, that is, the most important texts of a Book of Hours. The illumination is the work of an artist who was active in Paris around 1400 and who depicts elegant figures in a picturesque landscape, still on a gold background, while his color palette is already that of the 15th century. This hand is to be attributed to the workshop of the Parisian Josephus-Master. At least two miniatures – the jester miniature (f. 44r) and the miniature of the Office of the Dead (f. 131r) – are attributed to the pseudo-Jacquemart. 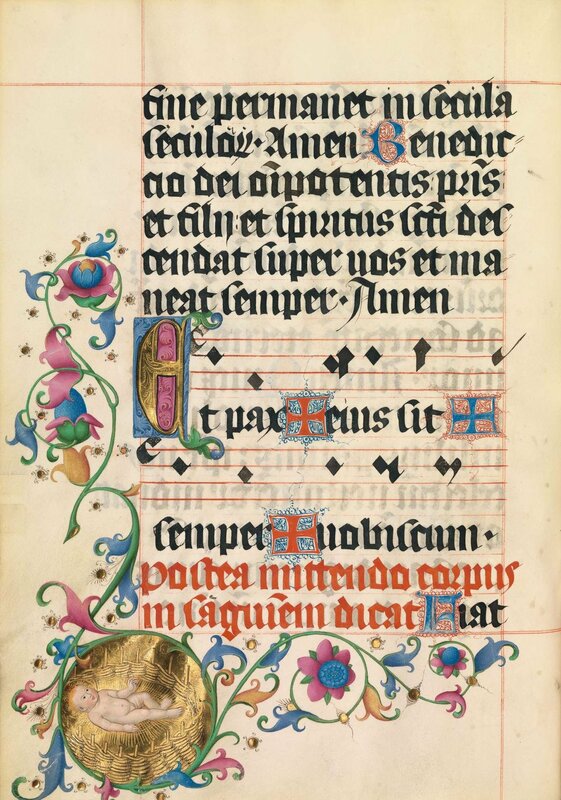 This amazing psalter is a riot of colour and gold. 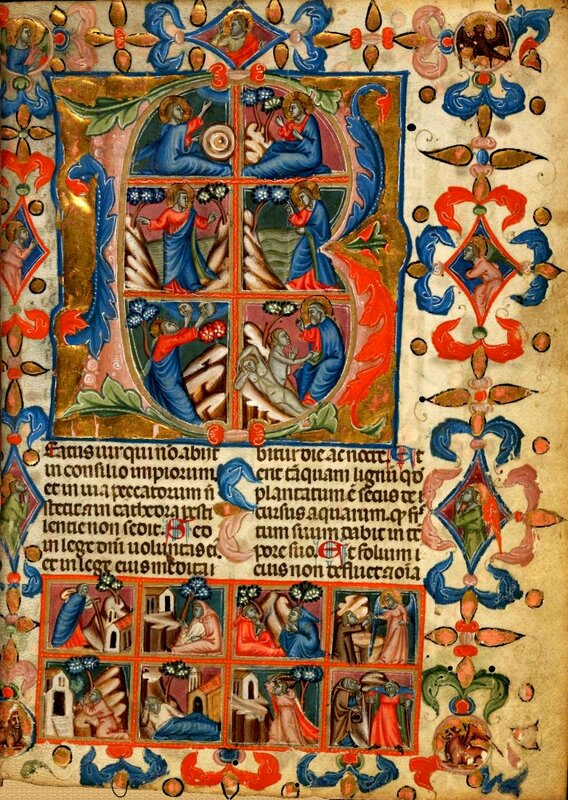 Grotesques and monks, angels and laymen adorn the borders, while almost every page has one or two historiated initials with gold backgrounds. Never let anyone tell you the Middle Ages were dull and boring! Suitable for a mid-14th century persona onwards. 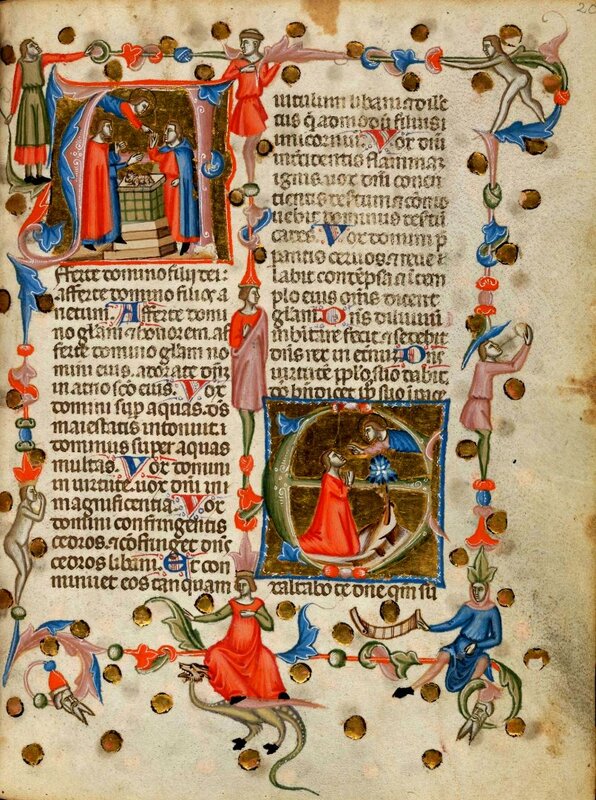 This incomplete liturgical psalter was made between 1335 and 1350 in Naples. The unusual decorations are the work of the artist Christoforo Orimina. Because the manuscript contains three different coats of arms, the original owner (a member of the Angevin court in Naples) can not be definitively named. After changing hands many times during the 19th and 20th centuries, the manuscript was acquired in 1968 by the owner of the collection "Comites Latentes" ("Hidden Friends") held by the Bibliothèque de Genève. You can probably tell I'm rather enthusiastic about this book. It is truly stunning. I offer it perfect-bound as A4 only, which is about 3/4 size. The details of the decoration are just too fine to reduce to a smaller size. 2 volumes (311 sheets and 293 sheets); 26.5 x 37.5 centimeters; latin. Note this is not a complete bible; it is the Old Testament up to and including Ezekiel. The other volumes have, alas, been lost to us. 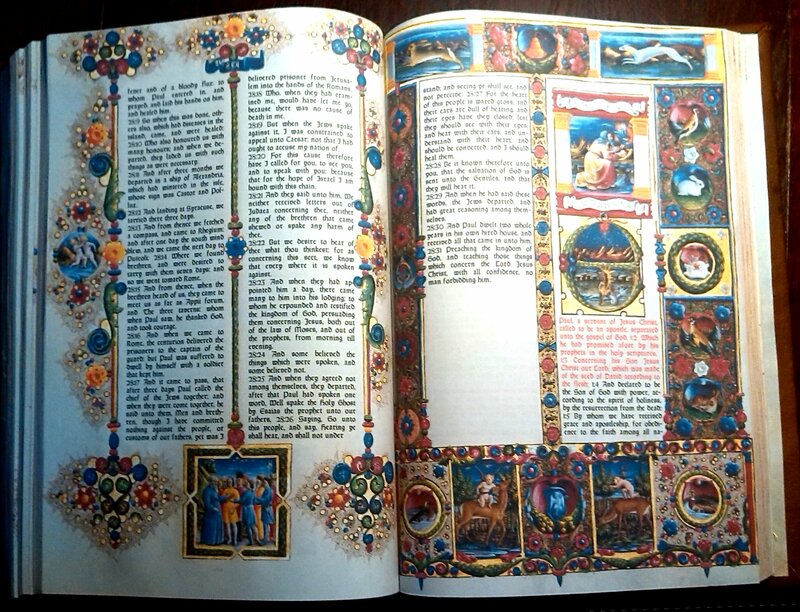 The magnificent Bible of Borso d'Este represents the zenith of Ferrarese miniature painting and one of the highpoints of Italian Renaissance manuscript illumination. It was commissioned by Borso d'Este (1413-71), the first duke of Ferrara, who intended it as a demonstration of the splendor of the House of Este, which at the time was competing with Florence and the court of the Medici for international status. 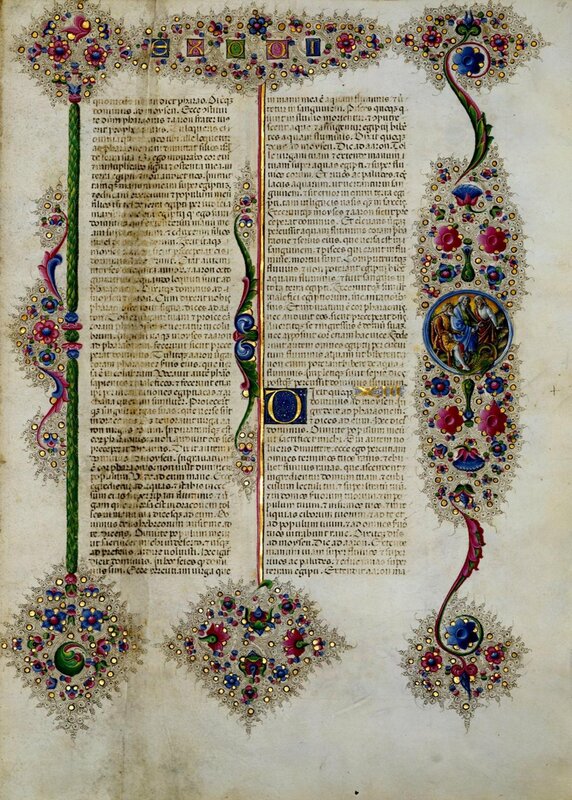 The manuscript was completed between 1455 and 1461, the same time that Johann Gutenberg was producing the first printed Bible from moveable type. 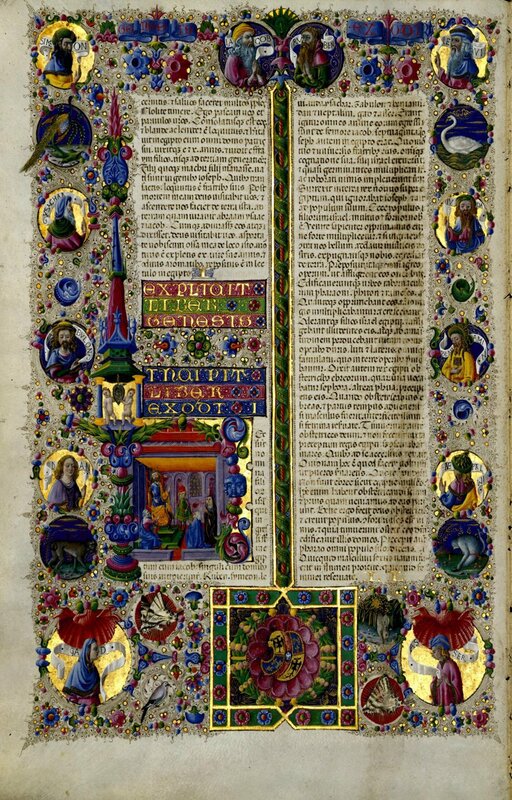 The Bible consists of two folio volumes of more than 1,000 individual illuminations. The leaves are all richly illuminated, with painted vignettes that portray scenes from the Bible, historical events, the Estense coat of arms, and views of nature. 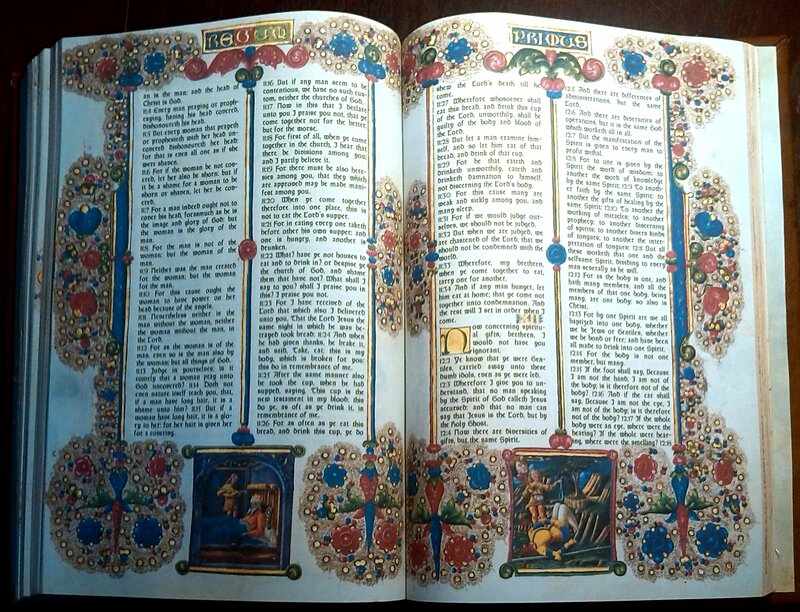 The beginning of each of the books of the Bible is decorated with an elaborate architectural border and richly colored designs. The illuminations are by a team of artists led by Taddeo Crivelli and Franco dei Russi that also included Girolamo da Cremona, Marco dell'Avogadro, and Giorgio d'Alemagna. 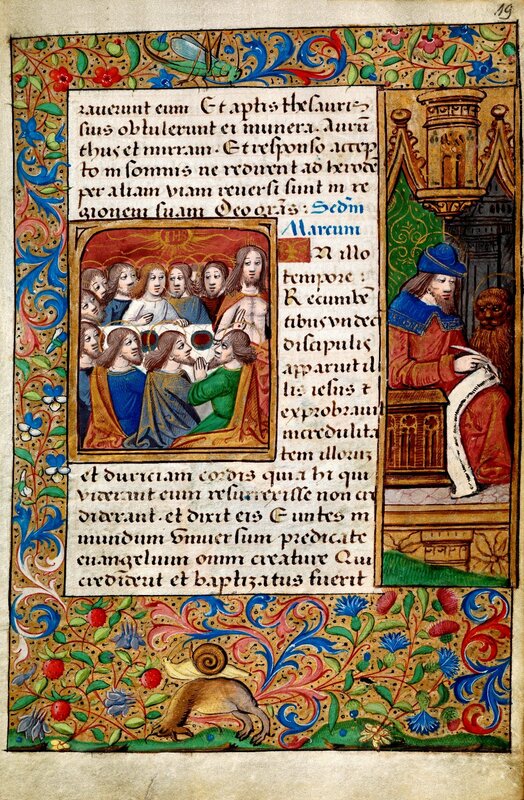 The text was written in a fine Renaissance hand by the Bolognese scribe Pietro Paolo Marone. In 1598, following the transfer of Ferrara to papal control, the Estense family abandoned Ferrara for its new seat of ducal power in Modena, taking with them their paintings, sculptures, and books. The Bible remained in Modena until 1859, when the city became part of the new Kingdom of Italy. Francesco V d'Austria-Este fled to Vienna, taking with him many family possessions, including the Bible. In 1923, the industrialist Giovanni Treccani degli Alfieri acquired the Bible from a Parisian antiquarian bookseller. 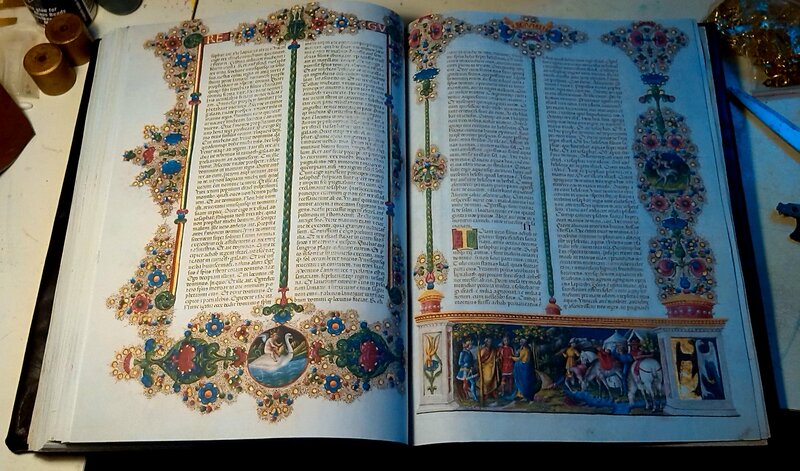 As a sign of respect for the Republic of Italy, he returned the Bible to the Biblioteca Estense in Modena. 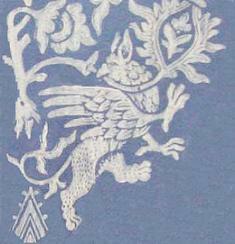 In the second half of the 18th century a new binding was made. The Bible was crudely trimmed and part of its decoration was lost from the upper and outer margins. The binding was again replaced in 1961. 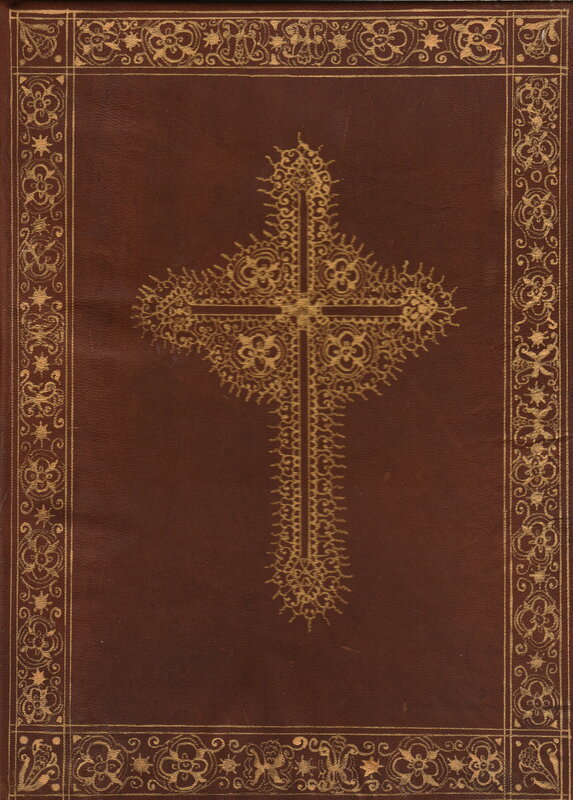 Leather cover with "gold" filigree penwork. The front and back are the same. A different cover design can be requested if desired. 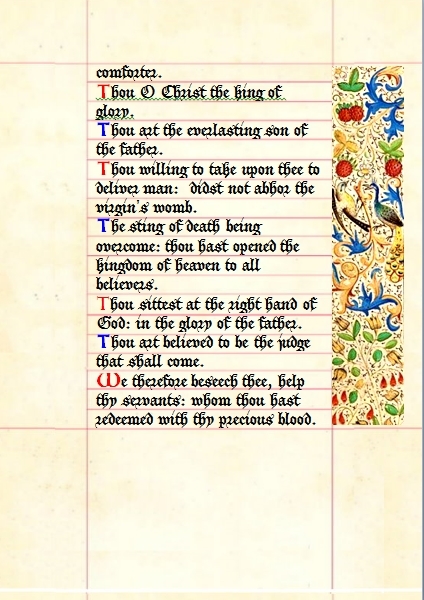 This bible uses the wording of the King James version of the New Testament in an appropriate, but readable, font set in the framework of the beautiful mid-15th century illumination. Like the latin version, it is A4 perfect-bound. To make this edition, I first made a copy of all the source images. I then went through them with an image editor, making a cut-and-paste collection of the chapter heading numbers in one Word file, and a nice range of each of the 4-line coloured initials that head up the chapters (you can see one in the first image of the pages above) in a second file. 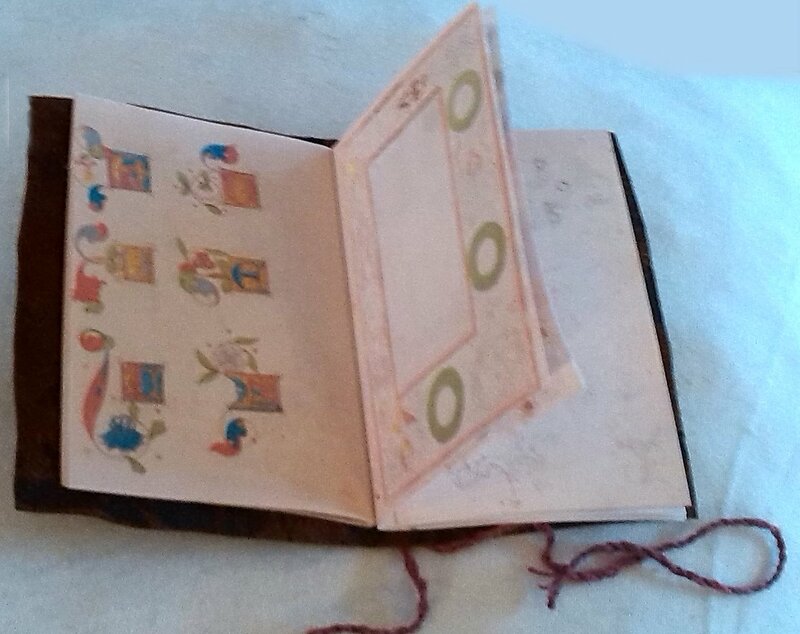 A third file got the miniature scenes, big decorated initials, and the images at the end and beginning of each book. Next step was to go through all the images again, choosing a nice even little section from the blank edge of each page and using it to fill in the text areas of the two columns. There is enough variation in the colour of the the parchment pages (from different hides and outer or inner side of the hide--the inner side is usually a bit whiter) that I could not use the same filler piece for all the pages. 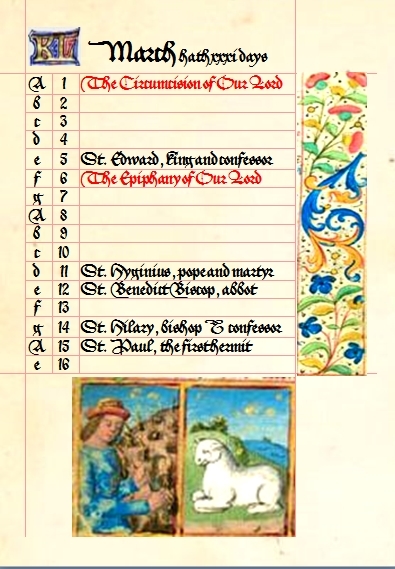 I then edited the Explicit/Incipit images--the book beginning/end images--to have the correct book names on them (in latin), and likewise some of the book names in the page headings. I stopped after the Gospels--it was just too much work. Each book of the New Testament was placed in a separate file, carefully formatted with the correct column widths and margins. The little chapter numbers were pasted in from file number one, the 4-line initials from file two, and both sized to fit the available space. Next the Incipits, extra illustrations and big fancy letters were positioned in the text, and each file adjusted to have an even number of pages (necessary for it to print correcly double-sided. Trust me.). Finally, each page image was added to the master Word file, sized appropriately, and carefully centered. Then I sat back and said "Never Again, I Must Have Been Mad." This is a book of great beauty. That's all. 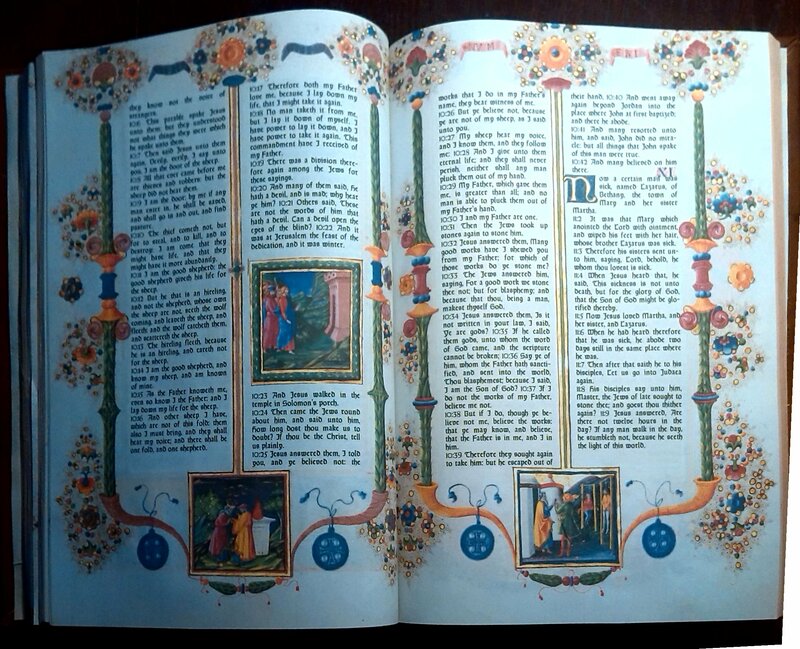 The five volumes of the monumental feast missal of the Salzburg basilica, now in the Bavarian State Library, is among the most lavishly ornate, and probably the most costly, medieval missals in the world. 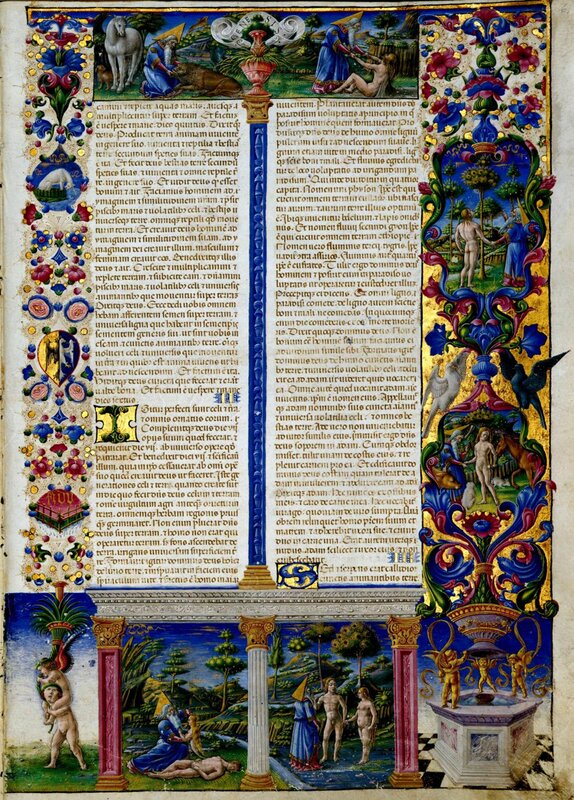 Commissioned by the Salzburg Prince-Archbishop Bernhard of Rohr (1418-87, reigned 1466-82), an art lover and bibliophile, the manuscript was completed by 1494 under the rule of his successors. It contains 22 liturgical texts for the most important religious feasts to be celebrated in the Salzburg basilica. 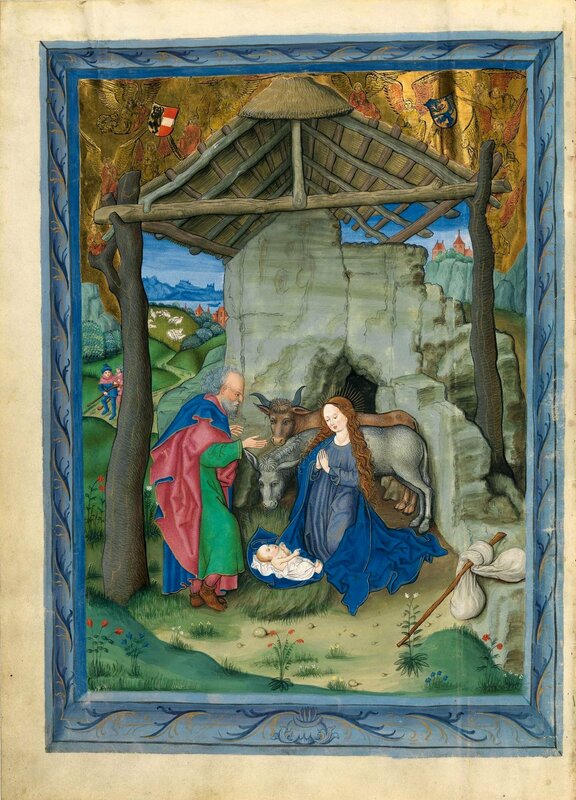 In the late 1450s, the Salzburg painter Ulrich Schreier began work on the magnificent miniatures, but soon after he had started Berthold Furtmeyr (circa 1435/40-circa 1501) was commissioned to continue. 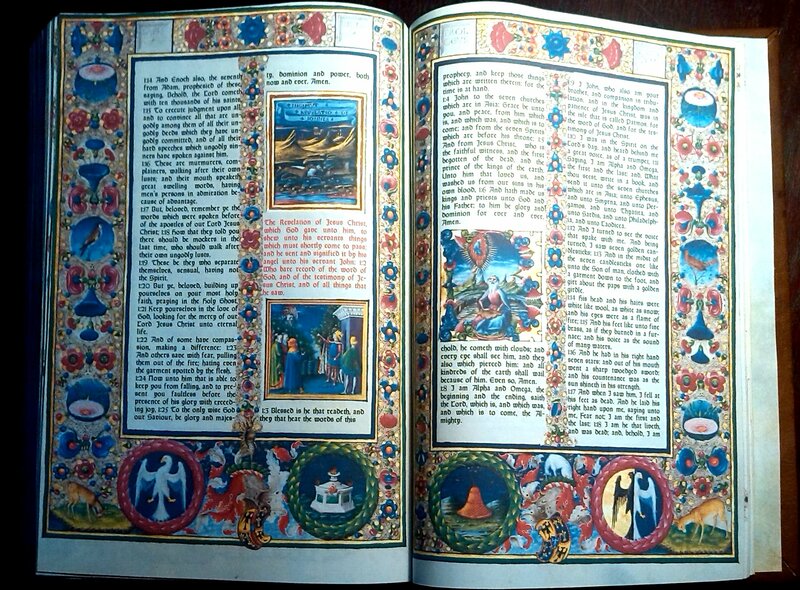 Furtmeyr decorated the volumes with splendid miniatures, and the missal is considered his mature artistic masterpiece. The extent of the work and the division of its 680 leaves into five volumes testify to the extraordinary demands of the commission. Written in large textura script, each volume is 38 centimeters tall and 28 centimeters wide, convenient to handle and at the same time impressive. 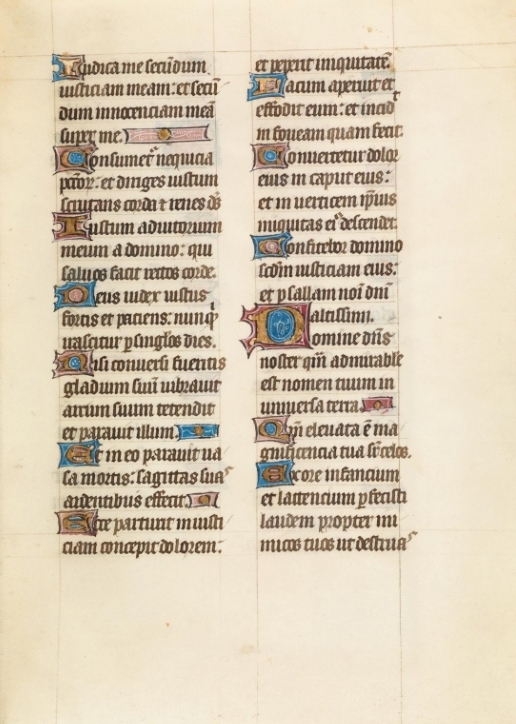 Each volume contains liturgical texts and brightly colored illuminations. 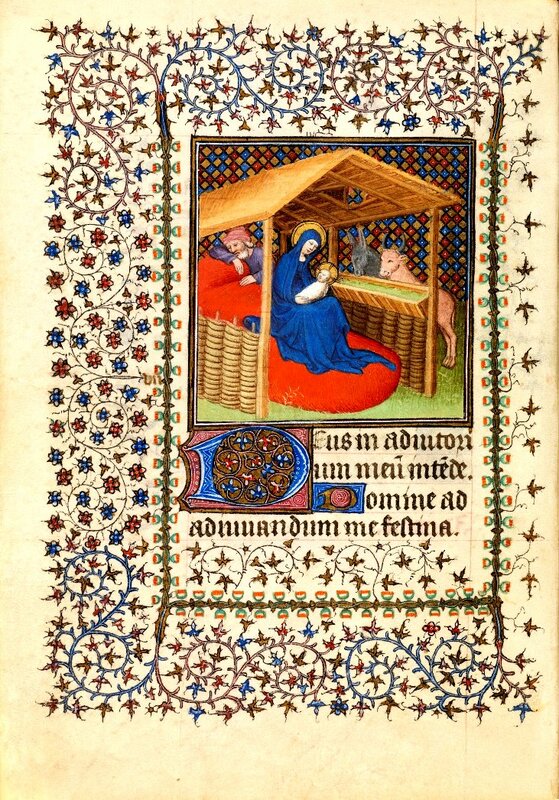 The first volume includes the three holy masses: the birth of Christ on December 25th, the Feast of the Circumcision of Christ on January 1st, and the feast of Epiphany on January 6th. The second volume contains liturgies for the Purification of the Virgin, the Annunciation, the Deposition of Saint Rupert, Holy Thursday, Easter, and the Ascension. Description from The Gutenberg Project: The Göttingen Model Book dates from the mid-15th century and originally belonged to a monastery. The manuscript arrived in Goettingen in 1770 with the bequest of the library of Johann Friedrich Armand von Uffenbach. It is a painting book for the drawing of leaves, initials and patterned backgrounds in different color combinations; even the composition of the colors is described in detail. The book decorations described in this manuscript can be found in the earliest period of printing in several Gutenberg Bibles, including the Göttingen copy of the B42. 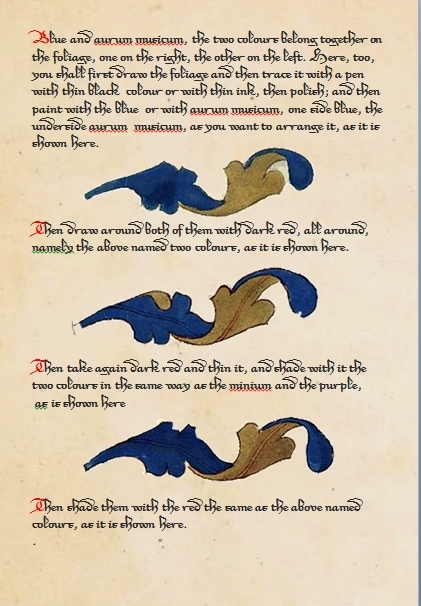 Not only a visual comparison of the forms and colors, but also microfotographic tests have proven that even the layering of the colors corresponds exactly to the instructions in the manuscript. 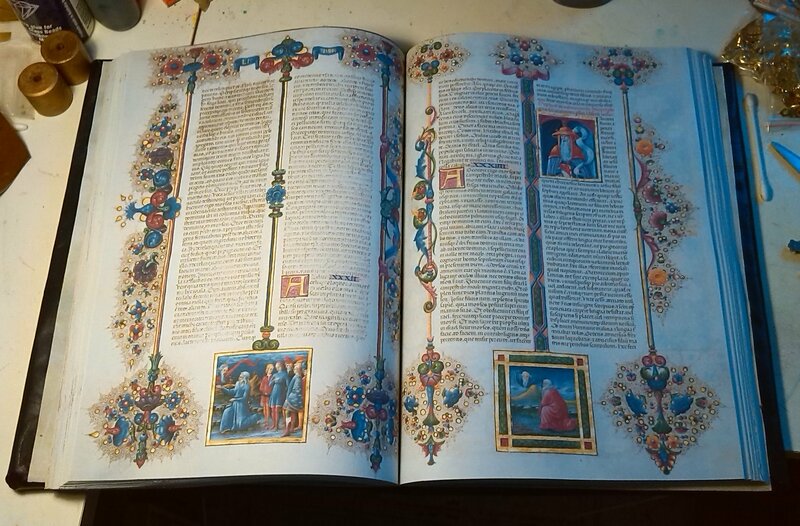 With its precise instructions on how to design and intensify colors, the Model Book also played an important role in researching the techniques involved in medieval book illumination - a joint project carried out in Goettingen under the sponsorship of the German Research Foundation (DFG) and the Volkswagen Foundation. This manuscript is available in latin or English, or both bound together in the same simple leather folder with hand-spun silk cord. It is a little smaller than A5. I have collected as many pages as I could find on the Internet from this workbook, which is of great interest to scribes for the insight it gives into Schriber's methods, as well as its beauty. It have produced it in A6 format, as this is all the resolution of the images is sufficient for, but I suspect it was actually about A5. 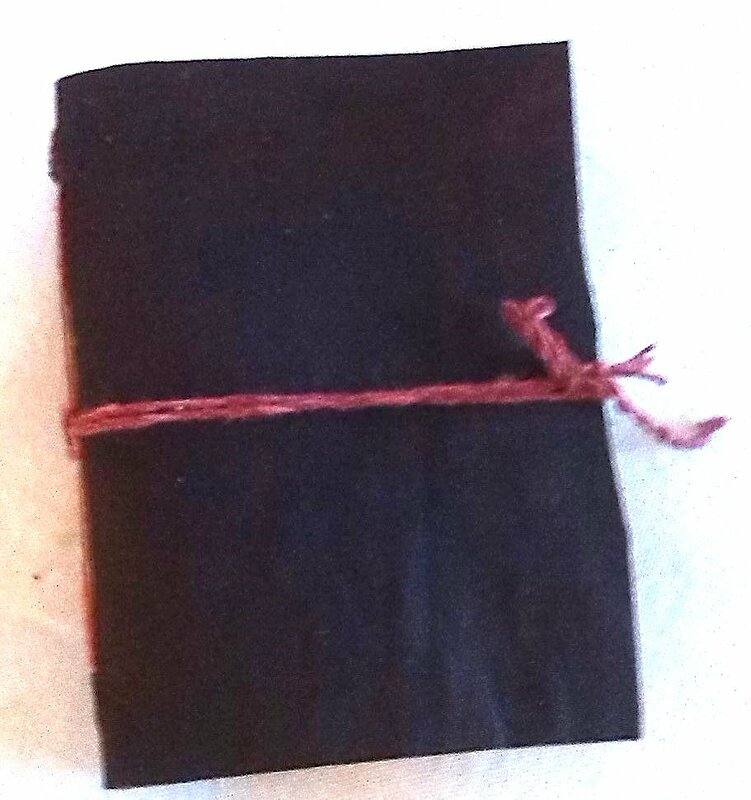 It is bound in a simple leather folder with hand-spun silk cord. Below are some descrpitions from the Internet. The Illuminated Sketchbook of Stephan Schriber (1494) Selected pages from the Spätgotisches Musterbuch des Stephan Schriber belonging to a 15th century monk working in South-West Germany, where ideas and layouts for illuminated manuscripts were tried out and skills developed. It was dedicated to Count Eberhard of Württemberg. 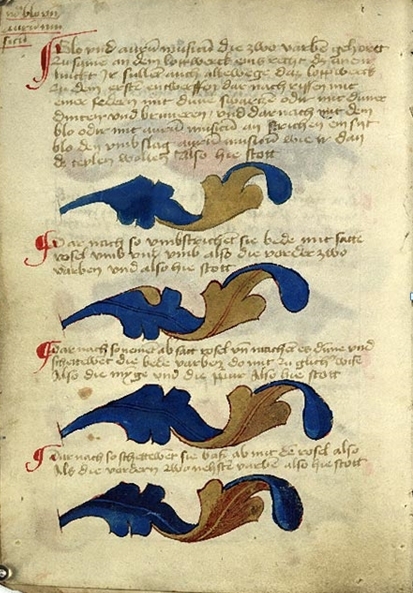 The parchment manuscript appears to be a manual of templates and/or a practice book containing partially completed sketches, painted and calligraphed initals, stylised floral decorative motifs, plant foliage tendrils, fantastic beast border drolleries, together with some illumination work.